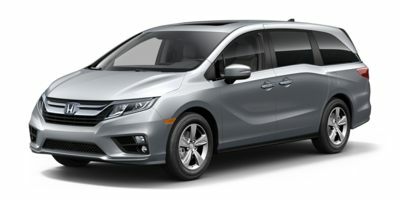 *DESIRABLE FEATURES:* BACKUP CAMERA, HEATED SEATING, BLUETOOTH, MOONROOF, LEATHER, REMOTE START, BLIND SPOT MONITORING, a 3RD ROW SEAT, a POWER LIFT GATE, LANE DEPARTURE WARNING, FOG LIGHTS, MULTI-ZONE AC, TINTED GLASS, KEYLESS ENTRY, and a POWER SLIDING DOORS.This New front wheel drive 2019 Honda Odyssey EX-L Auto features a *Forest Mist Metallic Exterior with a Beige Leather Interior*. *TECHNOLOGY FEATURES:* This Honda Odyssey Includes Steering Wheel Audio Controls, Keyless Start, Satellite Radio, Memory Seats, an Auxiliary Audio Input, an Anti Theft System, Digital Media Storage, an AM/FM Stereo, a Garage Door Opener, Memory Mirrors, an MP3 Compatible Radio, and a HD Radio*STOCK# KB084518 * Honda Marysville has this 2019 Honda Odyssey EX-L Auto ready for sale today with an additional *96 Other Odysseys Like This In Stock! * Don't forget Honda Marysville WILL BUY OR TRADE FOR YOUR VEHICLE, MOTORCYCLE and/or ATV! *DEALER CONTACT INFO:* Call Honda Marysville today at *(888) 639-8830 TO SCHEDULE YOUR TEST DRIVE* of this 2019 Honda Odyssey EX-L Auto! Honda Marysville serves Marysville, Dublin, Urbana, Lima, Delaware, Marion, OH. You can also visit us at, 640 Coleman's Blvd Marysville OH, 43040 to check it out in person! *MECHANICAL FEATURES:* Scores 28.0 Highway MPG and 19.0 City MPG! This Honda Odyssey comes Factory equipped with an impressive 3.50 engine, an automatic transmission. Other Installed Mechanical Features Include Power Windows, Heated Mirrors, Power Mirrors, Power Locks, Traction Control, a Power Sliding Passenger Door, Front Wheel Drive, a Third Passenger Door, Disc Brakes, a Tire Pressure Monitoring System, a Telescoping Wheel, a Power Passenger Seat, Cruise Control, a Rear Window Wiper, Intermittent Wipers, a Trip Computer, Power Steering, a Tachometer, Variable Speed Intermittent Wipers, a Spare Tire (Small Size), and Remote Trunk Release*INTERIOR OPTIONS:* Automatic Climate Control, Dual Power Seats, a Sunroof, Power Moonroof, an Overhead Console, a Leather Wrapped Steering Wheel, an Adjustable Lumbar Seat(s), a Power Drivers Seat, an Adjustable Steering Wheel, Air Conditioning, a Pass-Through Rear Seat, Illuminated entry, Bucket Seats, a Driver Illuminated Vanity Mirror, a Passenger Illuminated Visor Mirror, Rear Seat Center Armrest, a Beverage Holder(s), Vanity Mirrors, a Bench Seat, a Split Folding Rear Seat, Floor Mats, a Tilt Steering Wheel, and a Rear Window Defroster*EXTERIOR OPTIONS:* Aluminum Wheels, a Power Fourth Passenger Door, Privacy Glass, a Fourth Passenger Door, an Auto Headlamp, and a Spoiler / Ground Effects*SAFETY OPTIONS:* a Back-Up Camera, Side Mirror Turn Signals, Electronic Stability Control, Daytime Running Lights, Brake Assist, Integrated Turn Signal Mirrors, Emergency communication system, a Rear Head Air Bag, Occupant sensing airbag, Knee AirBag, Delay-off headlights, Anti-Lock Brakes, a Drivers Air Bag, Overhead airbag, Child Proof Locks, a Passenger Air Bag Sensor, a Front Side Air Bags, an Auto Dimming R/V Mirror, a Front Head Air Bag, and a Passenger Air Bag**Don't want to spend the extra money on Factory Navigation? Well this Vehicle is compatible to have Full On Screen Dash Display Navigation by plugging in your iPhone or Android phone (Apple CarPlay and Android Auto!) iPhone- iOS 7.1 or later, iPhone5 or later. iPhone Maps, Messaging, Phone, Music and compatible 3rd Party Apps. Android- 5.0 or Higher. Google Maps, Google Now, Phone, Messaging, Music and Numerous Popular Aps. Make Sure to Check the PHOTOS Above and VIDEO to See It! ** DISCLAIMER: Sales Tax, Title, License Fee, Registration Fee, $250 Dealer Documentary Fee, Finance Charges, Emission Testing Fees and Compliance Fees are additional to the advertised price. Any available rebates included in sales price in lieu of any special financing / lease incentives unless otherwise indicated. Internet prices are available to everyone.